Posted on October 25, 2017 by treelawyer	tagged. No old swimming hole at the sweeping turn of a country creek was complete without some old inch-thick length of hemp rope attached to a high cottonwood branch. 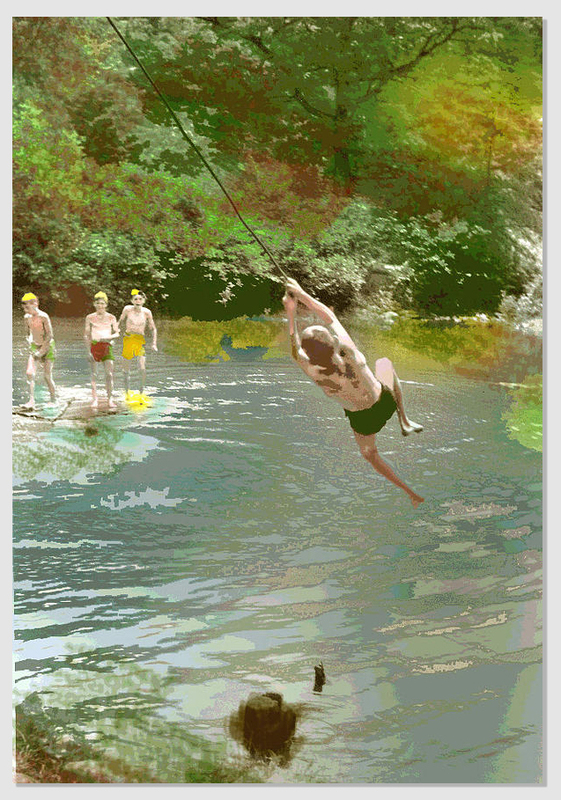 When the country boys of yore would skinny dip, they would swing high out over the creek, release and plummet into the cool water. That was then. This is now, as the Town of Chester, New Hampshire, found out. The town had a pretty nice park with a pond, open to the public without charge. Some time ago, persons unknown attached a rope to a tree overhanging the pond, and people use it to do exactly what country kids did a century ago. 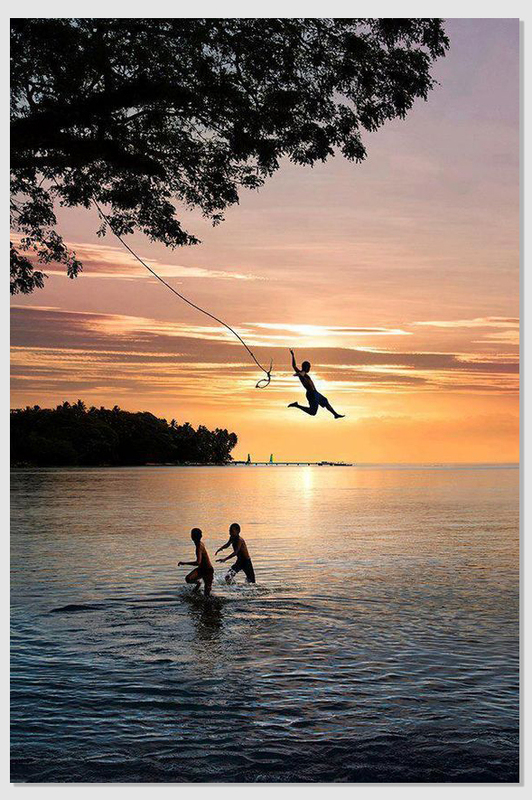 To make the game more interesting, sometimes a second person would stand near the rope to slap the feet of the person swinging on the rope before that person splashes into the water. The Town Selectmen were concerned the rope was unsafe. At this point, the logical response would be to remove it. 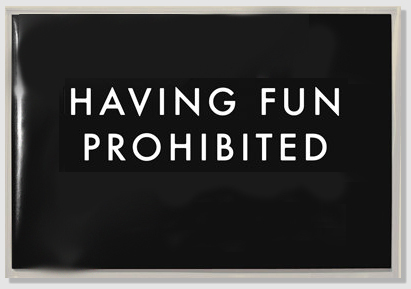 Instead, the Town talked about erecting a “no swimming” sign, but that never happened. The Selectmen asked the police what was being done to stop things. The Chief said the cops kept a list of people seen using the swing. The rope appeared about five years ago, which is when the complaints started. Town residents voiced their concerns again in 2013, 2014 and 2015. Nothing happened. Except the inevitable, that is. On August 20, 2015, 12-year old Christopher Kurowski was at the pond, trying to touch the feet of a person swinging on the rope. The two collided, and Christopher was seriously injured. Naturally, the town was sued. And just as naturally, it defended under the New Hampshire recreational use immunity statute – RSA 212:34. That statute provides that “a landowner owes no duty of care to keep the premises safe for entry or use by others for outdoor recreational activity or to give any warning of hazardous conditions, uses of, structures, or activities on such premises to persons entering for such purposes, except… [t]his section does not limit the liability which otherwise exists: (a) For willful or malicious failure to guard or warn against a dangerous condition, use, structure or activity… (d) When the injury suffered was caused by the intentional act of the landowner. The whole idea behind recreational use statutes like this one is to encourage private landowners to make their land available for public recreational uses by limiting their liability. Chris’s lawyer gave the Town a run for its money, ending up in the New Hampshire Supreme Court. While the Town won, the frugal Selectmen probably wish they had just cut the swing down when it first appeared. Hardly an elegant solution, but a final one. And cheap. Kurowski v. Town of Chester, Case No. 2016-0406 (Sup.Ct.N.H., Sept. 21, 2017). 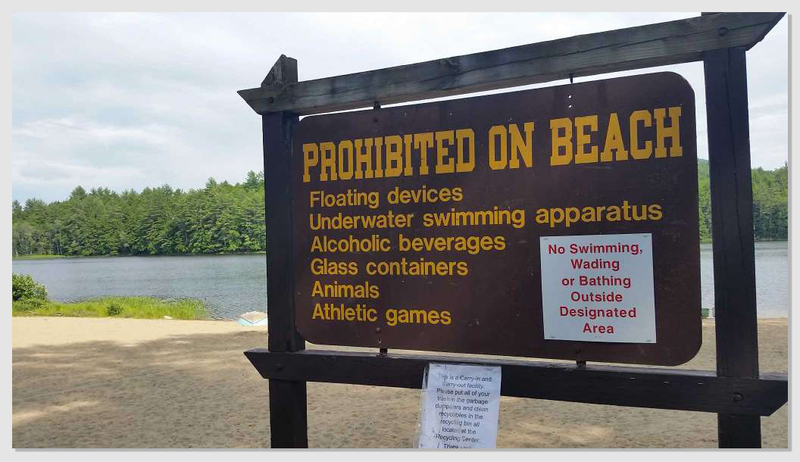 The Town owns and maintains the Wason Pond Conservation and Recreation Area, which includes walking paths and Wason Pond, open to the public free of charge. Since 2012, a rope swing has been attached to a tree overhanging the pond. No one knows who put it there. A local resident told the Town Board of Selectman he was concerned about the safety of the rope swing. She asked the Board to install “no swimming” signs near the swing area. During the meeting, one Board member observed that the swing was a hazard. The police chief reported that police practice when trespassers were found using the swing was just to take their names and list them in a report. The Board heard similar safety complaints in the following years, but it did not remove the swing or post any signs. One hot day in August 2015, young Chris Kurowski was playing at the pond, standing in the path of a person using the swing. When Chris tried to touch the feet of his friend, who was swinging on the rope, the two collided, and Chris was badly hurt. Chris’s father sued Town on Chris’s behalf, claiming the Town negligently or willfully or intentionally failed to remove the rope swing or post warning signs. The Town filed a motion to dismiss, arguing that the plaintiff’s suit was barred by one or both of New Hampshire’s recreational use immunity statutes – RSA 212:34 (the state tort claims statute) and RSA 508: 14 (the recreational use statute). The trial court granted the Town’s motion to dismiss, holding that RSA 212:34 barred both of the plaintiff’s claims, and that additionally, RSA 508:14 barred the plaintiff’s negligence claim. Held: Assuming that both RSA 212:34 and RSA 508:14 apply to municipalities (an issue the court did not rule on), the New Hampshire Supreme Court ruled that under the state tort claims statute, RSA 212:34, the Town was immune from liability on all of the plaintiff’s claims. Therefore, the Court did not rule on whether RSA 508:14 applied as well. The Court said that Chris’s activity was similar in nature to the enumerated activity of “water sports.” In fact, the Court had previously held that RSA 212:34 barred an action against a landowner for injuries sustained by a plaintiff who dove into a lake, striking his head on a submerged rock. The Court said it was not deciding whether Chris’s definition of “willful,” which he took from a decision interpreting California’s recreational user statute, was the right approach, because even under that definition, Chris would lose. The Court ruled he had not alleged that the Town had “actual or constructive knowledge that injury was a probable, as opposed to a possible, result of the danger.” While he complained the Town knew about the swing and did nothing, “an allegation that a landowner knew about a particular hazard and did nothing is insufficient to establish that the landowner knew or should have known that injury would probably result from that hazard… At most, such allegations sound in negligence. Finally, Chris’s dad argued he had showed that his son suffered injury as a result of the Town’s intentional acts. He said the Town’s conduct constituted an intentional act for the same reasons he asserts the Town’s conduct was willful: because the Town acknowledged that the rope swing was a hazard, was warned about that hazard on three occasions between 2012 and 2015, did nothing to remove it, and did not post warning signs. The Court disagreed, holding that the “mere knowledge and appreciation of a risk – something short of substantial certainty – is not intent.” At most, Chris’s complaint was that the Town was negligent, that the Town disregarded a substantial risk and failed to act. Negligence is not actionable under RSA 212:34.